Tired of playing basketball sweating under the sun on your driveway? Now you can bring the fun into your swimming pool. Basketball hoops are a popular pool game that kids and adults have enjoyed for decades. Whether you are a novice or a professional, basketball hoops allow for endless fun on a team or shooting 3 pointers from the shallow end to the deep end. Who doesn’t enjoy a backyard game of corn hole? Chuck-O Splash allows you to cool off in the water with a floating board. Don’t worry; the same rules apply to Chuck-O Splash, just as they would to corn hole. 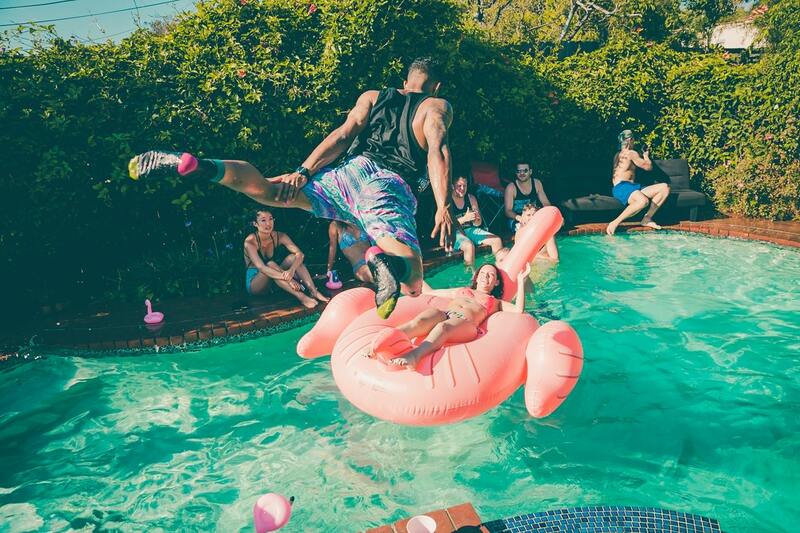 For hours of fun, consider this game for your next pool party! If you’ve ever been to a tailgate or BBQ, you’ve probably played the land version of Slot Slam, also known as Kan Jam. This pool version features an inflatable buoy where the main goal is to throw the three Frisbee-like disks into the slot. Players can get a thrill with this game by creating teams for some friendly competition with a challenge. Commonly played by children, toypedos are thrown underwater as they accelerate to the speed of a torpedo. This toy also allows for endless entertainment as children dive into the pool finding the toypedos. Even better, they can play catch with it underwater. Toypedos allow for creativity to fly as kids create their own rules and games. Pool inflatables are increasingly popular as manufacturers roll out brand new outrageous designs. Now you can lounge in the center of a diamond ring, hop on a banana, or swim through a donut hole. With a variety of designs, shapes, and colors, inflatables act as both a relaxation floatation device and pool decor. Also, rafts, which were once used for relaxation down lazy rivers, now come equipped for pool games. Certain inflatables also feature water guns to mimic battle station. Bring the Olympics to your pool for friendly rivalry games! Similar to rugby, this competitive game requires two teams and one ball. As each player attempts to throw the ball in the opposing net, players will get a great workout treading water as they play. Though this game typically calls for treading water during play, beginners can play in the shallow end where they can stand. Something as simple as beach balls are surprisingly the best toy to have. Beach balls offer fun both inside and outside of the pool. Swimmers can play catch, throw it back and forth to guests outside the pool, or simply work on their volleyball skills. Do you have a self-proclaimed king or queen in your family that is in need of saving from the dragons? If you answered yes, then you must have noodle swords available. Noodle swords look just as they sound; they are pool noodles in the shape of a sword. Whether your children have to fend off the evil dragon or swat away any pesky bugs, noodle swords are essential to any pool this summer. Beach volleyball is a timeless summer activity. But pool volleyball is even better. Nothing says summer more than having a good ole game of pool volleyball to enjoy with family and friends. With a volleyball net set up over your pool, it adds in the extra challenge of moving around and playing the actual game. 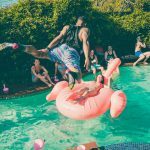 While throwing parties, cooking on the grill, and lounging poolside are typically outdoor summer activities you can amp up the fun and energy for all your friends and neighbors with the right pool toys. Remember to supervise children and go over pool rules to ensure everyone remains safe while they splash around. Looking for more ideas to make your luxury swimming pool more enjoyable? Contact the premier NY and CT pool professionals at Shoreline Pools today!